Most of us have heard of time outs. Many of us have even tried them on our kids, perhaps even successfully. In my personal experience, time-outs never worked for me and my 3 and 1/2 year old boy, because he never sat still in the same place for the stipulated time. But he sure knows what a time-out means. Which is perhaps one of the biggest reasons he enjoyed this book! The title of this book was what caught my attention when I spotted it on the library shelf. 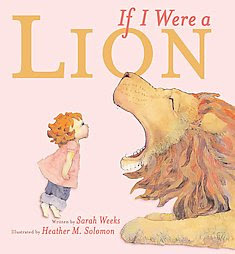 'If I were a lion'.......really sparked my curiosity to find out more about why a little girl would want to be like a lion and what would she do if she were one. The little girl in the picture is the one with the time-out. Her Mom just cannot take it anymore, and tells her she's on a time-out because she is just too w-i-l-d! But our little protagonist here is highly indignant about being described such. She goes on to justify what wild really means by comparing herself to the animals that are r-e-a-l-l-y wild and their behavior and habits. In fact she is so convincing in her arguement that you have to give her full credit for the unjustness of her punishment. Each page is filled with illustrations of the animal or wild being she compares to, to show what a true opposite she really is. The illustrations are done with a flourish and seem to flow riotuously throughout the page in a vibrant bundle of colours......the expressions on this little girl's face are so alive with spirit and fire that you identify with her each step of the way. 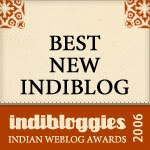 P.S - I just found out that the author, Sarah Weeks has written soooo many books and has a pretty cool blog and website. Check it out if you're interested! Adorable one! I am sure my daughter will enjoy this book - she loves all kinds of cats - domestic and wild...And of course the concept of time-outs which she is aware of in theory no practical experience though...We keep using that word in our house without never having applied it..funny, isn't it? Sounds like a real fun book. Will certainly read it to my daughter when I get a chance. Thanks Praba. A proxy time-out is something I am hearing for the first time and it sure sounds effective. You are so good about being in the loop even while u're on vacation. Hope you're enjoying yourself every day and minute. but, what is a time-out? Hi Satish...not a stupid q at all...a time-out is given to a child when he/she misbehaves or has a tantrum or goes a little wild and you want them to slow down, calm down, and diffuse the situation for awhile. Its a parenting tactic to calm your child down so u can rationalise with him later. This is a time-out in my opinion. Wishing peace, health, and happiness in 2007 and always. Happy New year to you and your family !